I had NOTHING to do with the BEST part of this twitter conversation. I started with a tweet about my theory on @Snowden whereabouts/chance of ever hearing from him, again. Don't know if it means they HAVE him or he's no more to be had (dead); but it's possible we NEVER hear from @Snowden, again; and will never know what happened, if DOA. He hasn't tweeted for 6 days, now. I see #Anons referring to bunker-bust of a couple weeks ago. I'm of the same opinion. I think him living and talking had too many loose ends, and the CIA nixed him. I've seen things re: JA which have made me question his place among the living, as well. JP Barlow dying a week after Q's reference kinda tells me some clean-up occurred. OK, good! I'm calling it OFFICIAL & CONFIRMED! Like how many licks to center of a Tootsie Pop...some things we may never know. Except we DO NO, he's never seen/heard from again. Except one question. You say CIA nixed #Snowden. I operate under the belief that Q & #QAnon is #NSA. (I haven't followed Snowden's history/whatnot until recent #Q posts, so I'm not Mr. Expert; but DO think Q=NSA. What do YOU think? Having followed this from the beginning (well nearly the beginning), and working in the field, Q is definitely NOT an AI. It's more than one person, of which DJT is one of Q. 2. How do you propose they get around that? What about the layers of cryptography embedded in the posts? Get around what? The stringers? They're coded messages that someone knows how to decode. Don't need AI for crypto. You would to create the forward/backward "mirror" of the "map" and to make the holistic puzzle fit seamlessly into place, particularly when they're pegged to future events which are only "likely" to occur. I will disagree with you there. Margin of error too high. I'm not saying they didn't use computers to plan this. They did. The planning is complex and took 3 years IIRC. It just doesn't require AI to be Q. AI would be used on the SIGINT side to figure out what's important for humans to look at and to draw lines, but not to be Q. That's exactly my point. It's people using this. The AI assisting the Q group has quantum capabilities.it has to: the law of diminishing returns states only so much data can be cross-referenced using binary methods before thermodynamics kicks in. This plan = HUGE data. This doesn't require quantum. It's a fairly straightforward (though complex) machine learning task. It's a multi year project to do it and train the model, etc. but it's not like self aware. 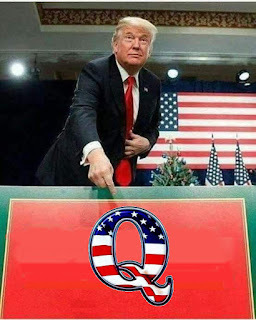 Not for Q. Large volume? Yes, but manageable. I respect your position, but I will respectfully disagree. Where did the Nazis (Project Paperclip) go for Vril technology? Mediums. Nikola Tesla? Same (see Maria Orsic). The DoD used remote viewers.The paradigm was set early on to have a "magic mirror" in this game. Thus, AI. "it seems that “JADE” is an acronym for a DARPA-developed A.I. quantum computing technology that produces holographic battlefield simulations and will be in charge of the drill in order to “master the human” domain and predict human response."